Legendary Wars may not be as legendary as its title implies, but it may get there one day. 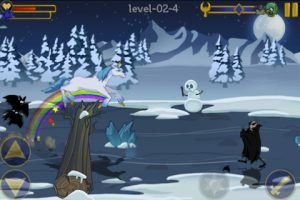 The App Store is inundated with these kinds of “castle vs castle” games, but Legendary Wars looks to stand above the pack with simple yet entertaining gameplay, multiple extra features, and a smoldering bad boy unicorn named Spike. Developed by Liv Games, Legendary Wars is a tower defense game where you gather resources and build up an army to attack or defend. Your troops consist of knights, elves, dwarves, wizards and unicorns that shoot rainbows– but not in a gay way. In an awesomely gay way. Your enemies are hordes of monsters and undead creatures which include skeletons, zombies, vampires, Joan Rivers, werewolves etc, etc. The gameplay is solid. It’s challenging enough without being frustrating and winning the tougher battles can be very satisfying. The game is mostly a real time strategy, but there are a few side-scrolling action sections thrown in as well. Surprisingly, these potions of the game are quite fun and are a refreshing departure from the main game that keep things from becoming monotonous. There are also role playing game elements. After a successful battle you are awarded with gems that can be used to upgrade the stats of your castle and your warriors. This is a crafty element to the game that keeps you chugging away toward the next level, as if the developers where dangling the gems in front of your face like a carrot on a rope. While the campaign mode itself is already pretty lengthy, the game also includes extra modes in the form of endless battle, side scrolling, and survival, which add to the replay value. The presentation is very well done. The music has that epic fantasy feel you would expect, and the art style is pleasant enough. It is quirky without being obnoxious. There is a storyline, but it mostly exists as a formality used to push the game along from level to level rather than engross the player with compelling characters (except for Spike the unicorn of course). Thankfully, it doesn’t take itself too seriously and can be rather humorous at times. 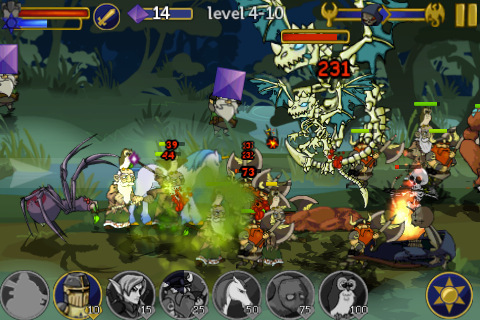 Legendary Wars is one of the few games on the iOS that feels like an actual game. There is so much packed into this title, it’s almost surprising that it is currently being sold for a mere 2 dollars. 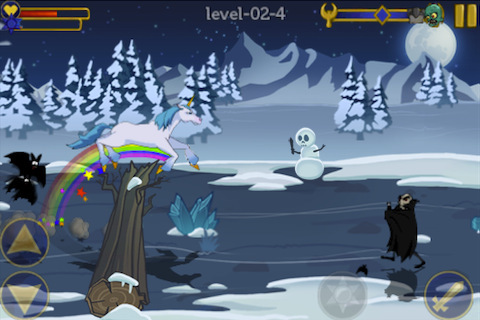 It’s fun and engaging and there are smack-talking unicorns that explode in fountains of rainbow blood. And that is worth the price of admission alone. You can check out Legendary Wars for yourself at the game’s official App Store page.